Solar hot water systems make sense for virtually any home or business with available sun and space for panels. It is a very efficient use of solar heating panels since it is typically being utilized every day yearound. 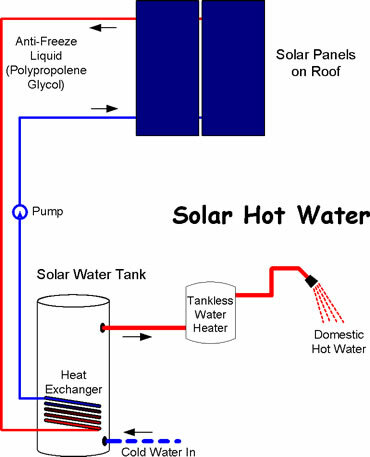 It is most efficient to have a dedicated solar storage tank which is only heated by solar energy. 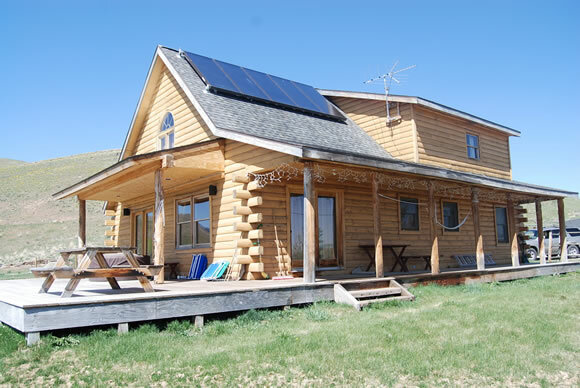 If space or cost are an issue, it is possible to use a single hot water tank that is heated both by the backup heating element (gas or electricity) and solar. The most efficient configuration is a dedicated solar storage tank that preheats water for a tankless water heater. That way no water is kept constantly heated - even when it isn't being used. Solar heating systems convert the sun's energy into heat that can be used to heat hot water or building spaces. Solar heating panels are generally made of copper plumbing with dark pipes enclosed in an aluminum frame with a glass cover. When sunshine strikes the panels it heats the liquid in the pipes. When enough heat is available a sensor turns on a pump and the heated liquid is moved into the building through a plumbing loop. In climates where freezing is possible, the liquid circulating through the solar panels is usually a food-grade anti-freeze. The heat is transfered to water in a solar storage tank via a heat exchanger.